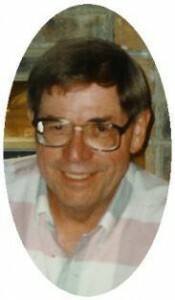 Harold H. Wedemeyer, 82, of Briarwood Lane in Port Washington died at his residence Thursday, April 30, 2009 after four years of ill health. He was born July 14, 1926 in Chicago, Illinois to Henry and Martha Young Wedemeyer. He grew up in Park Ridge, Illinois and served in the military during World War Two. Upon his return he studied Electrical Engineering in Chicago. He married Martha Mellin of Chicago on November 7, 1953 in Chicago. They moved to the Milwaukee area for work and resided in Hales Corners for over 32 years. He was a studio supervisor for the television station Channel 12 in the early 1960’s for 12 years before working for Johnson Controls, producing Education Programs in the Television Film Production department for 15 years, retiring in 1988. In 1990 they moved to Port Washington. Harold had a long lasting love of aviation and was active with the Experimental Aircraft Association (EAA) in Oshkosh, Wisconsin. Together with his wife, they were active volunteers for the EAA’s Annual Airshow for many years. He enjoyed playing golf, traveling, tending his garden and home. He was a gentle man who shared his life with his wife spending most of their time together and recently celebrating 55 years of marriage. He is survived by his wife Martha of Port Washington and children Joanne (Tom) Looze of Madison, Wisconsin, John Wedemeyer of Port Washington, Steve Wedemeyer of Eau Claire, Wisconsin and James (Irene) Wedemeyer of Merrill, Wisconsin. Further survived by granddaughter Monica and Molly Looze and sister Elaine (John) Detweiler of Brooksville, Illinois, other relatives and friends. Rev. Patrick Wendt will celebrate a Memorial Mass of Christian Burial at 6 pm Friday, May 8, 2009 at St. Peter of Alcantara Catholic Church, 1800 N Wisconsin Street, Port Washington. Visitation 5 – 6 pm Friday at church. Memorials to the Port Washington Food Pantry appreciated.